UNITED NATIONS, July 25 -- When the UN announced on July 20 that it was confining over 700 Moroccan peacekeepers to their base in Bouake in Cote d'Ivoire, due to allegations of sexual exploitation, it was portrayed as the UN finally getting tough on abuse by peacekeepers. 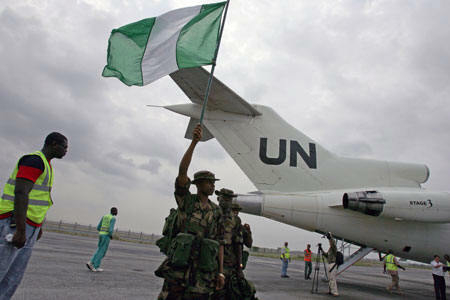 Wednesday it emerged that the 700 confined peacekeepers had only been in Cote d'Ivoire for less than two months. The wrongdoers were already transferred out of the country. If the past is any guide, they will not face meaningful discipline back in Morocco. The rotated-in 706 soldiers are fall guys, essentially, for those who came before them. It is the UN getting tough -- but on the wrong individuals. The UN, which condemns both hostage-taking and collective punishment, appears to be engaged in a little bit of both. At a press conference on Wednesday, Jane Hall Lute, now Officer in Charge of the new Department of Field Support, spoke compellingly about zero-tolerance for abuse, about being offended as a mother and as a soldier. She chided a correspondent for smiling when she mentioned the UN's $8 a month entertainment stipend for peacekeepers, saying that while a reporter who "lives in midtown Manhattan" might smile at the idea of movie night, "I've been on deployments, I know what it's like." Regarding Cote d'Ivoire, Inner City Press asked how long the investigation by the UN Office of Internal Oversight Services had been going on -- only since the July 16 report from the Department's own conduct and discipline unit? No, Ms. Lute said, the OIOS investigation was going on much longer than two weeks. Inner City Press asked, when did it start? "I can't get into details," Ms. Lute answered. It took repeated questions by a Moroccan journalist to yield the information that the now-confined contingent has been in-country less than two months. (The journalist says it is a mere 41 days.) This information should have been given on July 20, or certainly in Ms. Lute's opening remarks on Wednesday. While there has been a call for the UN to get tough, it goes without saying that newly rotated-in peacekeepers are not the ones who should be targeted. In Cote d'Ivoire scuttlebutt, it is hard not to connect the breakdown in discipline with the UN Mission's lack of a Special Representative of the Secretary-General for months now, and even with the confusion still surrounding the shooting at Guillaume Soro's plane in Bouake. Inner City Press has been shown a letter from Soro's Forces Nouvelles to the acting head of the UN mission, questioning the cantonment of the entire Moroccan force. It has simultaneously been reported that Burkina Faso is sending a force of 150 to help protect Soro -- implying, it seems fair to say, a lack of confidence in the UN peacekeeping force. Normally, a strong action like confining to base 700 soldiers for alleged abuse might increase confidence in a force. But if you are punishing the wrong individuals, and this fact only comes out after the third or forth question, which way the confidence meter tilts remains an open question. Inner City Press asked why the investigation of now-confirmed charges of Pakistani peacekeeper involvement in "natural resource exploitation" -- read, gold smuggling -- in Eastern Congo took so long, and whether the UN has gotten any commitment from Pakistan to bring to justice who found to have traded in gold. "I can't answer your last specific question," Ms. Lute said. Video here, from Minute 43:43. What, then, does no impunity mean? Ms. Lute said that Under Secretary General Guehenno's comment that the Congo gold trading inquiry is "closed" has been clarified to mean that the report is closed. "That was clarified," she said, "if we need to do that afterwards again, we can do it." Clarity might help. Ms. Lute in her Wednesday press conference encouraged the press to tell her when they become aware of possible wrongdoing. Afterwards, Inner City Press handed her a print-out of an email complaint of sexual exploitation and gem trading in the Congo Mission, with a request to find out what happened with the charges. We can find out, Ms. Lute said. We'll be waiting. It's our belief that such questions is to the long-run benefit of peacekeeping. Click here for a Reuters AlertNet piece by this correspondent about the National Reconciliation Congress in Somalia, note the cancellation of the UN's pre-Congress flight to Mogadishu.